For my birthday my boyfriend took me to London for the weekend and then he surprised me with booking a holiday to Tenerife through Aronasol whilst we were there! We chose to stay in Villa De Adeje as it seemed good value for money and picked a one bedroom apartment. The resort was roughly only a 10 minute drive from the airport and in a good location. Although the pool area was really nice, as the hotel was only 500m from the beach it made sense to go there a couple of times too. The apartment was nice and clean and had everything necessary for a comfortable stay. There were loads of facilities there but we only used the hot tub and the squash court, the gym looked really nice and well equipped but we didn't use it. The buffet restaurant was really good, we ate there a couple of times but we mostly went out to eat on a night as there was such a good selection of restaurants nearby. Stayed hear with my husband and 3 children aged 12, 4 and 18months. Please think twice about travelling to this hotel. The location is excellent, but that is it. Food terrible and we ate out regular in very resonable chinese buffet restaurants, but really why should we? having payed all inclusive. Snacks are shocking and I can safely say health and safety haven't visited recently. Our youngest son fell out of high chair on 2nd day, but staff still blamed him for jumping about, when he was just siting there, although they weren't long in calling doctor who promptly was looking for 60 euros which eventually hotel payed ALL highchairs were replaced the next day not before time by the look of them about 15 years. Pool disgusting rooms gruby and staff rude and not enough of them. We stayed hear for Christmas and New Year and expected something special both nights as stated, but we ended up across the road for the bells, very, very poor set up and in need of total refurbish. I have stayed in a good few number of 3 star hotels, even 2 star, but this was very disappointing and needs people to write honest reviews for fist choice to take notice. 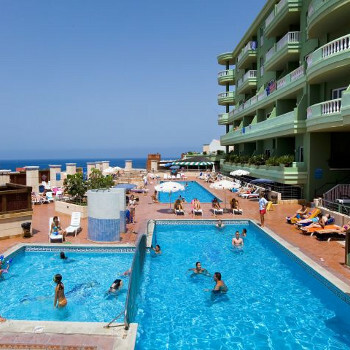 Tenerife is well worth a visit and Loro park, Siam park and aqualand should be visited we are looking to return next Christmas all been well but not to this hotel. having read many bad reviews of this hotel I was a little worried about going. We arrived late at night, after the restaurant had closed but found cold meats, cheese, rolls and fruit in our studio. The food was ok but repetitive, the hotel was clean and certainly no cockroaches were seen. The pool area was cleaned daily but was very dangerous as the tiles were smooth and very slippery when wet. They also got very hot and I wouldnt advise anyone to walk barefoot. The staff were very friendly and helpful. The packed lunches provided werent particularly appetising tho. The entertainment was non-existant but there were a few activities organised. I would say that you get what you pay for and as its a 3* hotel I wouldnt expect anymore than what we got. Apart from the pool area there isnt much for kids to do, despite the brochure saying it was ideal for families. The rep from First Choice was lovely tho and went out of her way to help us, she did tell us tho that she felt the hotel was not suitable for families and that first choice would be removing it. I would recommend this hotel to couples rather than families. The hotel is close to Siam Park-within walking distance although there is a free bus and the stop is just outside. Well we were here in august for 2 weeks went all inclusive, was great holiday. pool activities all day for kids and teens , staff very friendly but some had their days. then poolside bar was chips hot dogs burgers pizza toasty, drinks were great too. dinner was soup, or you could have chips, potatoes , all veg was there, meats of every kind then you also had your salad bar too. having stayed here twice before (when it was ocean beach) we thought we would try it again, everthing was fine the place was clean if a little grubby had clean towels and beds made everyday!the place was full of spanish people who incidentally only pay 30 euros per night for all inclusive (fair play)the staff wernt too bad but on our last night we went to get my son some chips from the chippy and the man behind reception shouted at me asking where my wristband was i explained we were self catering and didnt have 1 he then asked my name and room number which i gave him and he smugly informed me that we wernt staying there he had got my room number wrong and after a bit of a debate conceded that yes we were staying there i received no apology for him shouting at me especially when it was in front of other guests!! very poor room cleaning cockroach infestation on the lowerlevels. dinosour you might like it. staff 75% very very rude 15% OK 10% good. Just back from this hotel, myself, sister, her partner , her daughter and her daughter. we had an excellent week at this hotel. mostly all positives. the rooms were spotless, maids in every other day. clean bedding and towels regular. the pool area was lovely although for smokers, no ashtrays provided so they used empty drink cups and then binned them in over flowing bins by pool, not a lovely sight! the food was ok, not brilliant but not bad either. it was kinda lukewarm at times. the bar staff were pretty miserable, not a lot of smiles of chat from them. the entertainment was ok, mini disco , bingo and a different type of entertainment each night. the hotel itself is spotless, could not fault that. we had a few cockroaches in rooms too, but it was pretty hot! would recommend this to families with younger kids and i would definately stay there again. hotel was very clean.staff very busy and quick to serve you food or drink.beach is just a small walk down the hill.was a great holiday for the price and for the hotel only being 3* as it can't be far off 4*.just back april09 and don' have a complaint.